It was one of the best analogies I ever had given to me; yet it took me years to grasp its fullness. Like any true seed of ‘spiritual’ insight, it was strong enough to lie on the rock till a little pocket of earth developed beneath – a receptive place into which it could extend its roots. We all grow up thinking, without question, that ‘thought’ is continuous, and the basis for our ‘in-here’ existence. It may take a lifetime to see that the thought-machine that fronts our world is our own creation and coloured with our thinking and emotional history. This colouration paints ‘the’ world, making it our world, familiar in its likes and dislikes, fears and moments of courage – many of them unobserved, except by that mysterious watcher within us. The world we inhabit is therefore the sum total of our reactions to everything that has happened to us. Many of these reactions protect us – like knowing not to put our hands onto something burningly hot; others fill us with prejudice against threats that are not present in our moment. The ocean in which this history exists is the internal ‘field’ of our thoughts. ‘Look, there’s a cherry-blossom tree!’ We cry, imposing the history-carrying words over the raw and beautiful experience of the reality. Names are useful, but they also pre-program our seeing. Knowing this, we can work backwards if we choose, and repeatedly use the word so that it temporarily loses its meaning. We may then find ourselves on the edge of a kind of fear. Have we damaged our brain’s memory of what a cherry-blossom tree is? Of course not… but staying within that uncertainty may teach us something. Just seeing how the mind takes that defensive stance is instructive. If, instead of allowing that fear, we carry on with the exercise and spend a ‘mute’ few minutes next to the ever-changing perfection of the tree, we may experience the gap – the light – between the railway carriages of the train of consciousness thundering by on its eternal and dominating journey. In those precious moments, we may see that there is a landscape beyond the noisy and flashing train, one that comes slowly into focus and reveals itself as a very different place, yet one to which we are, most certainly, closely related – since we and it are now still… gazing upon each other in a new way. 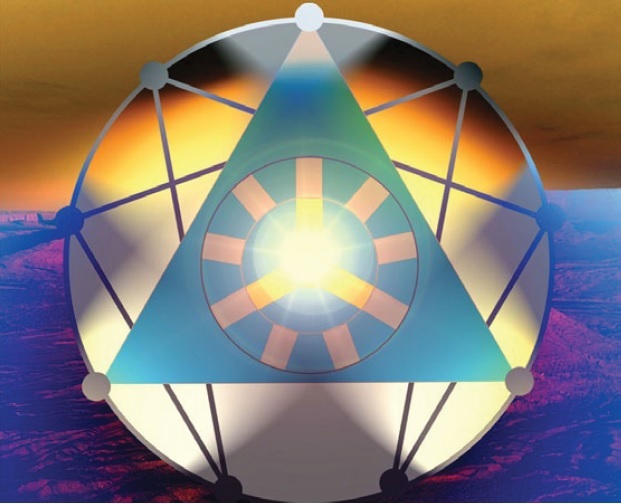 Stephen Tanham is a director of the Silent Eye School of Consciousness, a not-for-profit teaching school that helps people find a personal path to a deeper place within their internal and external lives. “Stand still…” I placed the newly-found basis of a godly crown upon his head. “I am not wearing a plant pot on my head!” To be fair, I should probably have waited until there was nobody else in this section of the garden centre, but we were on a mission. And I needed the right sized plant pot. “No-one will ever know.” He had little cause for complaint… I’d be wearing one too, seeing as I could not have the glorious golden crown of ancient Sumer. It would be my job to make sure that we did not end up looking like a latter-day Bill and Ben… but a little ingenuity and gold paint should do the trick. The rituals are written and in the process of being edited, proof-read and polished. The task of assigning roles, creating props and costumes has begun in earnest and April seems to be speeding towards us at a rate of knots. I love this part of the process. We do not expect those who join us for the weekend to spend a great deal of time and money creating costumes for the characters they will embody during the rituals… but they usually surpass our expectations, and each bit of colour and detail adds to the illusion we create. That illusion is the ‘window-dressing of the mind’… an aid to the ‘suspension of disbelief’ and a route into the collective imagination. The greater the reality we can suggest through costume, props and music, the easier it becomes to open ourselves to that Greater Reality we hope to touch through these weekend workshops and the Paths each of us follow. The core members of the group always go the extra mile to create costumes that lend something special to the atmosphere we are seeking to create… and this time, it starts with a pair of humble plant pots. Symbolically, that is actually rather neat. The deepest and most beautiful aspects of the spiritual life and journey are always rooted in the simplest of things. What if you came along and joined us for the weekend…? January…and the clock is ticking down to spring. Work that has been going on all year now changes gear. It began in earnest last year, with a research trip to the British Museum to see the art and artefacts of an ancient civilisation that was at least the equal of Egypt, but which is less well known today… Sumer. Over seven thousand years ago, long before the pyramids were dreamed of, the people who would become the Sumerians settled in Mesopotamia. Their culture was rich and colourful. We know that music and the arts were of great importance to them…and their city of Uruk, home to up to eighty thousand people at its height, was the centre of their world. Gilgamesh ruled in Uruk almost five thousand years ago and his story passed into legend and thence into myth. It comes down to us, echoing through the ages, as the Epic of Gilgamesh, which is regarded as the earliest great work of literature known to Man. The earliest version we now have was found in Nineveh. It was already ancient when a scribe named Sîn-lēqi-unninni collected the tales and wrote them down, over a thousand years before the birth of Jesus. The story, though, is not ‘old’ in anything other than age. It tells of the adventures of the king, a story in which he is both villain and hero by turns. It is a very human story, though the gods of old walk through its pages, and although it can be read as ‘no more’ than a myth and an ancient curiosity, it can also be read as a representation of a human journey through life to the dawning of a greater awareness. It is a magical story, wholly relevant to any seeker who has set their feet on a path towards self-development and a wider consciousness. It is also a story that resonates with our own time, where we encroach upon the natural world with little respect for its life and purpose. The art and craftwork that we saw at the museum was beautiful and delicate. Tiny cylinder seals, intaglio carved and small enough to be worn in a ring, roll out scenes of gods, animals and starscapes.Jewellry of pure gold rests, fragile, on tiny springs so that leaves and flowers tremble with every movement. Ancient texts in cunieform, possibly the earliest form of writing and one of the greatest achievements of Sumer, tell forgotten tales… It was a good place to begin and we left the museum aware that the text we would use for our April workshop sprang from a great civilisation with a deep understanding of the workings of the human mind and heart. But, no matter how early you begin, the last few months are always against the clock as so much must be put into place when we begin to have an idea of numbers. This year, we know that once again, people will be converging from as far afield as Europe and the US to meet in a village in the Derbyshire Dales. Thousands of miles will be travelled between us as our various wheels turn and we head, from many different directions, to that central point of meeting. It is easy to compare those diverse journeys to the greater one we have all taken as we come together at this point. Only a few who will be attending are Companions of the School, and we have each taken very different spiritual paths towards this moment in time. There are those who have followed a Shamanic path; there are Qabalists and one who refers to herself laughingly as a witch… yet who lives the life of a priestess of the old ways with all her being. There are ritualists and those who simply follow where their heart leads; Rosicrucians and mystics, Druids, housewives, magicians and scholars. We have all walked our individual paths alone, some have also studied with other groups and schools, some tend the hearthfire and many still forge their own way towards the goal we all share. So what brings such a diverse crowd together, to share the adventure of a weekend workshop? That there will be fun goes without saying; these events are always a time of laughter. There is friendship of course… some old, some still to begin. Some are ‘old hands’, for others this will be a first time and a first meeting face to face with those only known through the ether. Yet beyond the smiles and greetings there is something else at work. Each of us, from our own unique place in the great tapestry of life, is seeking a common understanding of something we feel to be greater than our normal human consciousness can fully grasp. We each have our own vision, our own guiding light… we may call it by many names, or know it only as a vague yet insistent pull at the heartstrings. Yet the further you walk along your chosen path, the less the details matter, you see only the light that floods both the paths and the space between them… and that light is the same. This year the workshop takes us back five thousand years to the great civilisation of Sumeria. In exploring a world long dead, walking with the shadows of an ancient land, we are not harping back to the ‘olden days’ or hankering after times gone by… we are taking our own minds and placing them in an unfamiliar frame, where our perspective can shift. From fabric and gilding an illusion is born and, as within a dream, the illusion holds its own reality while it lasts. A ‘willing suspension of disbelief’ allows us to walk within that illusion and, as with a dream, what remains when we wake may cast the glow of understanding on our path. We are holding up the jewel of being and letting it refract a thousand rainbows from many facets… and in those moments we may catch a glimpse of their colours. Such a moment does not bring the kind of knowledge that can be learned from books, nor the understanding of conscious thought, though these too have their place alongside what is learned through experience. What is reaped from such gatherings is no more than a seed… yet a seed may contain a tree, and a tree a forest. At the end of the weekend, each will take from this time out of time something unique to them alone which we hope will serve to shed a mirrored rainbow on their own journey. As the wheel of the year turns towards Beltane, the time of renewal and Union, our gathering too will seek in the dark flame of a shadowy past a light for the future and perhaps move a small step closer to that greater Union between our human selves and that spark of Divine Fire that glows within every heart. “I need to do something.” Clinging to a lifestyle in which they felt themselves to be stuck, the person concerned said that a change was needed… a break in the pattern of their days, for to break just one link in a chain is to break free of it. But where to start? What if it wasn’t enough? The fear of failure was holding them back from taking even the smallest step forward that could potentially change everything. I know that feeling. I imagine that most of us have felt it at some time in our lives. Change and failure can be two of the scariest monsters we have to face and maintaining even a painful status quo can feel like a far better option than scaling a mountain of fear. Still, you never know what you can do until you try…and you cannot take a second step until you have taken the first, no matter how small a step it may be. I remembered climbing a mountain a couple of years ago. At fifteen hundred feet, it just about graduates from a hill to a mountain and to my eyes, it looked like one… especially as our route would take us up very a steep incline. I really wanted to visit a stone circle I had heard a lot about, but, recovering from a serious chest infection, I wasn’t sure I would make it. I was at that stage where I could walk easily on the flat, but any kind of climb, be it hill or stair, left me fighting for breath with heart pounding. Standing at the bottom of a slope that appeared to be almost vertical, I was quietly convinced I would fail… and afraid that in doing so I would let my companion down and spoil the day. It was hard going, especially as it was a hot and sunny day. Every few yards I had to stop and gasp for breath under the pretext of taking pictures. It wasn’t just me, though, my companion was struggling too… and in an odd way, that made me feel better. The slope seemed endless, and even when we reached level ground, the hill still climbed steadily in front of us. We managed to lose the footpath and had to clamber over rough ground, climb a rickety gate wrapped in barbed wire and, at one point, found ourselves wading through a field strewn with bones. And yet… we were in a landscape that was incredibly lovely, with bright blue sky above the hills and deep blue sea below. The heather was in flower, the sheep were purest white and there were wild horses watching as we climbed. After the initial climb, the going was easier, even though it was all uphill, and, when we arrived at the plateau below our destination, it was sheer beauty that took my breath away. I remembered too taking my younger son up Ben Nevis when he was a boy. We knew before we started that we would fail to reach the summit that day; there was no way we would make it to the top in the few hours we had at our disposal, but we would at least get a feel for the mountain and see beauty we would never have seen had we not made the attempt. I thought back too, to the first time I had attended an event with an esoteric school similar to those run by the Silent Eye. I was scared stiff of what I might find or whether I would fail to fit in… and was met with open arms and hearts, laughter and friendship. Or the time I had arrived at the Gare du Nord in Paris, terrified, owning nothing more than the clothes in my suitcase. I had left everything behind… home, friends, family, language… and was about to embark upon an unknown future. It could have been a disaster… and yet my years in France became the happiest I have known until recent years. Whenever I feel fear of change or failure weighing me down, I look back at all those times I have taken that first, small step. It can be as simple as a phone call, a break in a routine, or the determination not to let someone down. It need not be a big thing at all. Yet, as soon as you have taken it, one foot in front of the other, your world and your view of it has already changed. Even if you fail, you will have seen and experienced something new along the way… and going back to the starting point for another attempt or a different route is always easier ‘downhill’. Our final site of the day was to be one of the most astonishing circles we have visited. It is not the biggest, nor are the stones themselves the largest, but it has a ‘feel’ unlike any other. Castlerigg, which we would visit on our final day of the workshop, may rightly be accounted one of the most beautiful of circles, but what Long Meg and her Daughters lack in aesthetics, they more than make up for in sheer presence. On our very first visit, the light had been going and the winter dusk had been bitterly cold. We thought we knew what to expect…after all, we had seen enough photographs of the place. I had even a vague memory of having been taken there as a child. Yet, we had rounded the corner and been ambushed by the stones. Getting out of the car, we had literally bounced with excitement, like children at Christmas. The site was more, far more, than we had expected. For a start, the narrow farm track that is signposted for the ‘Druid Circle’ gives no warning when you are about to arrive. It does not stop at the edge of an enclosure or parking space… it carries on, straight through the circle, skirting stones that divide the track at one point. When we arrived with our party for the workshop, our passenger too felt that ‘psychic shock’ and was, moments later, out of the car and bouncing up and down like an excited child. The short winter’s day was drawing to a close and we would be in the circle at sundown. Unlike our last visit, equipped with cameras, the fading light would not linger and we lost no time in sending our party out to explore and attune with the stones. The circle is huge, the sixth largest in Northern Europe, and not really a circle at all. It is an oval, formed from the geometric form of the vesica, and some three hundred and forty feet across its longest axis. Although legends say that it is bad luck to try and count the stones, the usual count puts them at fifty nine stones still in situ out of the seventy original stones. The whole thing was once surrounded by a low embankment, which may have been white-faced with gypsum, allowing it to glow. The circle was built as part of the megalithic tradition which began around five and a half thousand years ago. The exact date of the circle and the surrounding enclosures and embankments is uncertain and its precise purpose is unknown, though much can be deduced. For a people who, like our ancestors, constructed interrelated sites across vast swathes of the landscape, it is probable that there is a relationship between this site and others in the area, including Little Meg, two fields away, and the henges we had visited. Not far away is the sacred landscape and Avenue at Shap… and you have to wonder if, as at Avebury and Stonehenge, these features formed part of a greater plan…and if so, did it echo the map of the heavens as our ancestors once saw it? There are larger stones in circles across the country, but the stones are far from small. The four quarter-stones are not local and are quartz-bearing. Most circles are built from a single type of stone, perhaps with a quartz-bearing stone, or even an entire boulder of quartz, such as we had seen at Boscawen-Un. 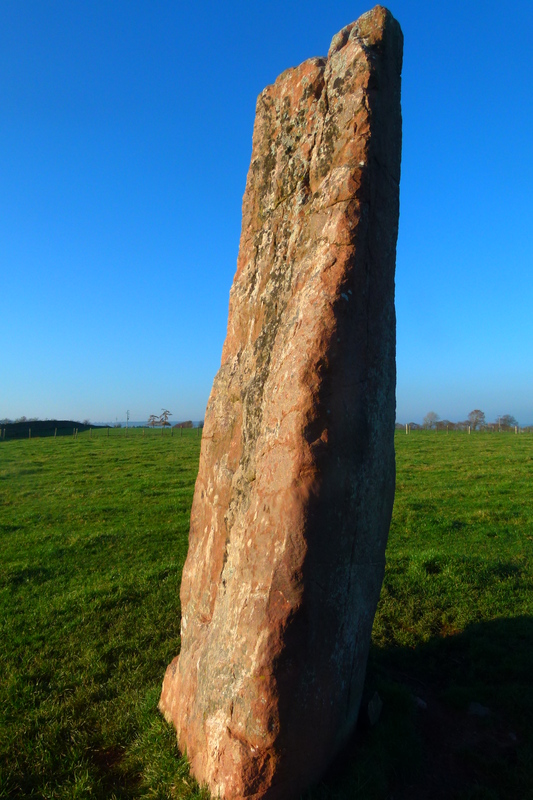 Here, however, Long Meg herself is a column of red sandstone that sparkles in the sunlight and which, with the quartz-rocks, differs from the rest of the circle. The technology of stone as it was known to our ancestors may be lost to us, but we have echoes in the use of crystal for both healing and communications technologies. Their choices of stone were not only deliberate but significant. The arrangement of the stones suggests a calendrical function that would work by standing outside the circle and sighting across to the quartz stones. Long Meg herself, standing outside the circle, is part of a Samhain alignment with a portal stone and one of the quartz rocks. Long Meg is a magnificent presence. Standing twelve feet tall, she is ‘tattooed’ with concentric circles and her uppermost surface is notched in the manner we have so often seen. This may be simple erosion, as is often averred, or the weather may have exaggerated an existing feature, but whenever we see this kind of notch we are struck by its similarity to the sight on an old-fashioned firearm. And this, we believe, was its function. Between anecdotal observations and the mathematical precision survey work such as that conducted by Professor Thom’s, a good many astronomical alignments have been proposed and observed, indicating alignments at solstice and equinox and particularly with Deneb, the brightest star in the constellation Cygnus. Deneb heads the Northern Cross in the heavens and, along with Vega and Altair, is one of the three stars known as the Summer Triangle that was used for navigation right up until the twentieth century, helping pilots find their way home. There are physical alignments within the landscape too and while the entrance to the circle frames the hills, their form is shadowed in he contours of the stones. As the day drew to its end, we gathered around Long Meg, focussing our minds and breathing. Closing our eyes, we once more sounded our ‘words of truth’, this time giving voice to the vowels which are the flowing seeds of sound. It is odd, but the voice changes when you work in this way; sound emerges unrecognisable from your throat as if illuminating hidden corners of your being. The words ‘breath of Creation’ passed through my mind, listening to the anonymous voices joined in unplanned harmony. As we ended our day, the light failed and the clouds broke, allowing a final glimpse of the sun setting behind Long Meg. Wishing I had not left the camera in the car, I reached for my phone, just to mark the moment. The stones were alive, glad, I felt, for our presence and glowing faintly in the twilight as the sky itself offered us a final gift. From Little Meg we had a leisurely stroll down a wooded path, to a tiny church we had glimpsed from the circle on our first visit. It had turned out to be one I had stumbled across in my research of the area and well worth a visit, even if, when we arrived, the doors were closed, for in the churchyard is an unusual cross. The weathered, Anglo-Norse cross is covered in scroll-work. The ends of the arms are carved with saltires …St Andrew’s crosses … which have figured frequently in our wanderings. Only the upper part of the shaft and the cross head remains from the original cross which dates from the 900s. Even the ‘modern’ base into which they are set dates from before the Norman Conquest of 1066. A close look at the carving seems to suggest that the ends of the scroll work are serpent heads… a nice touch, considering we were looking at the ‘serpent energies’ of the leys on our quest to find the ‘way home’. The leys may well have provided a physical presence as ancient trackways amongst their functions, with the monuments placed upon them being used as navigational aids. The cross belonged to the village of Addingham, which was an early, Anglo-Saxon settlement. The village was washed away by floods in the mid-fourteenth century, when the River Eden changed its course. The churchyard, though, was still used for burials for some time after the flood. In 1913, a drought dropped the level of the river and revealed a number of medieval grave markers, early carved cross shafts and another hogback stone which are now preserved in the porch. Records show that there was a church on the present site in 1272, although there is no record of whether an early chapel stood here. Interestingly, at that time, it was known as St Mary’s Chapel. The current dedication to St Michael and All Angels, marked by a modern stained glass window by S.M.Scott, means that two of the major leys of Britain are echoed here as the masculine and feminine energetic polarities are called the Michael and the Mary, which are also symbolised by the red and the white Dragons of Albion, mentioned in the story of Vortigern’s ill-fated Tower. The chancel of the church was rebuilt in 1512, and much of the rest of the church has been altered and rebuilt over the following centuries. The present building, lovingly cared for and restored, is a simple place of light and calm. For such a small church, it possesses a number of beautiful stained glass windows, including one that shows vignettes of Martha and Mary of Bethany, the sisters of Lazarus, at the feet of Jesus, with the raising of Jairus’ daughter. These are stories that have been making their presence felt lately as we delve into the Templar mysteries and they are a fairly unusual subject to find. Near the pulpit is the base of another stone cross, very ancient. It has been carved at a later date with what looks like a game, a variant of Nine men’s Morris, perhaps? Or were the holes designed to hold something? There are a number of simple memorial plaques set into the walls. Most poignant is the war memorial that commemorates far too many names for such tiny communities. For our purposes though,as we explore the relationship between the heavens and the leys, the one of particular note is the memorial bearing the sword transpiercing the star. Our meditation asked that each visualise the web of light, joining all sacred places on the earth and see it reflected in the heavens. We asked that each explore the relationship between the star map and the web of light on earth, finding one’s own place within it. The stones were moved somewhat from their original positions during the excavation, and yet the familiar form of the ‘tailed’ entrance into the circle remains. There was a report of another and similar cairn close by, but no trace now remains of this. Not far away is the small Glassonby circle that we would not have time to visit. It too has a stone carved with concentric circles and angular patterns…and here too, the design is placed so that only the dead will see it. For now, though, and in spite of the remains of a bird within the circle, this was a place of the living, not the dead, where the ends of time could be connected through the medium of the human heart and voice. Once more we sent our companions out into the field to speak their words to the winds. This time, however, we had asked them to seek the ‘seed’ of their word… the seed of words in general. At a previous workshop we had considered how, if you knew how to ‘send’ and ‘receive’ along the leys, one might, theoretically, be able to send a message by a type of Morse code, interrupting the current and letting it flow into the energetic ‘dots and dashes’ that could be interpreted when it reached its destination. We compared this to the role of vowel and consonant in words. The vowels flow while the consonants interrupt the flow. We have experimented with chanting at ancient sites over the past few years; was this, we wondered, relevant to why some chants work better in certain places? Those that are made up of pure vowel sounds, in contrast to those where the flow is ‘cut’ by consonants.